When I was a little girl growing up in Ohio, my grandmother used to rescue birds that had fallen from their nests prematurely. It was fascinating to watch her dip the corner of a rag into some sugar water and feed them. I believe she gave them raw hamburger if the bird was with her for a long period. Following her lead I have rescued a few birds that have flown by mistake into our rather large windows. One time I rescued a very tiny Mistletoe bird, scarcely 5cm long (2 inches in old money) and I was thrilled to bits when it regained its strength and hopped up onto the edge of the open box in which I was keeping it, and then onto the edge of the pergola and then onto a tree branch. Some days later I saw what I’m certain was the same bird just outside the door sitting on the same branch and singing its heart out, no doubt to thank me! 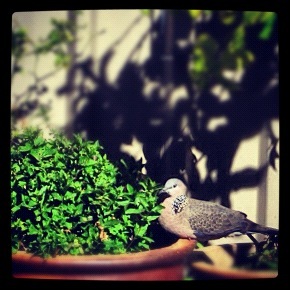 My attraction to birds persisted despite having been twice attacked by them! Once I was even at the happiest place on earth, Disney World, when swooped upon by a seagull who fancied my French fries!! What cheek!! Apparently it happens frequently as people have misguidedly hand fed the gulls fries over the years and they have developed a taste for them! The other time I was swooped upon was by a mother Spurwing Plover who mistakenly thought I was interested in her nest. Plovers are very territorial and especially if they have a nest in an area. They build nests near and on the ground in high weeds and so you can go near one and not know it, which is what I, apparently, did. Plovers have a serious ‘spur’ on the underside of their wings and if they catch you with it when they swoop you, it can do some damage, so I was not keen to be caught! Just looking at bird images makes me feel giddy sometimes. 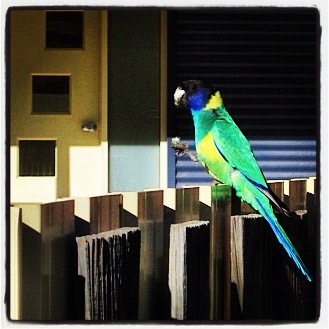 And always, always watching wild Budgies fly around the outback makes me joyous. They are the most brilliant lime green. As they carve up the blue sky in perfect synchronicity my heart soars! 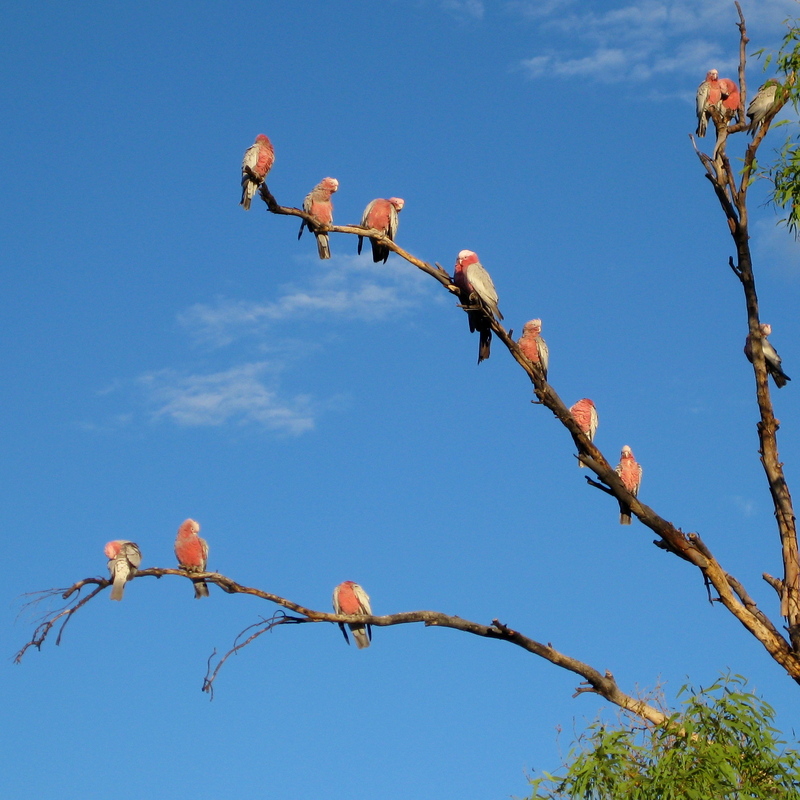 Galahs are the clowns of the outback. They are like badly behaved 12 year old boys!! They tease and tempt fate with their physical hijinx and they are loud and raucous to the point of distraction. They will gobble every scrap of seed that I put out for the tiny finches, unless I screen it from them. And then they let me know with their indignant squawks, they are not happy!! Perhaps the most beautiful bird we get on a regular basis is the Port Lincoln Parrot, the ring neck parrot, as some call them. They can be noisy at times, but mostly they are just gorgeous and eat quietly from the native plants we have in our garden. I’m sorry darling daughter, but my feet are firmly in the ‘love birds’ camp.